Andréassian, V., Perrin, C., Michel, C., Usart-Sanchez, I., and Lavabre, J.: Impact of imperfect rainfall knowledge on the efficiency and the parameters of watershed models, J. Hydrol., 250, 206–223, https://doi.org/10.1016/S0022-1694(01)00437-1, 2001. Andréassian, V., Le Moine, N., Perrin, C., Ramos, M.-H., Oudin, L., Mathevet, T., Lerat, J., and Berthet, L.: All that glitters is not gold: the case of calibrating hydrological models, Hydrol. Process., 26, 2206–2210, https://doi.org/10.1002/hyp.9264, 2012. Beven, K. and Hornberger, G.: Assessing the Effect of Spatial Pattern of Precipitation in Modeling Stream Flow Hydrographs1, Water Resour. Bull., 18, 823–829, https://doi.org/10.1111/j.1752-1688.1982.tb00078.x, 1982. Beven, K. J. and Kirkby, M. J.: A physically based, variable contributing area model of basin hydrology/Un modèle à base physique de zone d'appel variable de l'hydrologie du bassin versant, Hydrol. Sci. Bull., 24, 43–69, https://doi.org/10.1080/02626667909491834, 1979. Bowes, M. J., House, W. A., and Hodgkinson, R. A.: Phosphorus dynamics along a river continuum, Sci. Total Environ., 313, 199–212, https://doi.org/10.1016/S0048-9697(03)00260-2, 2003. Bronstert, A. and Bárdossy, A.: Uncertainty of runoff modelling at the hillslope scale due to temporal variations of rainfall intensity, Phys. Chem. Earth, Parts A/B/C, 28, 283–288, https://doi.org/10.1016/S1474-7065(03)00039-1, 2003. 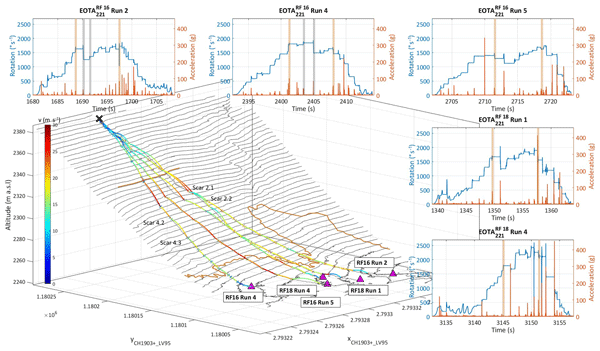 Castelltort, S. and Van Den Driessche, J.: How plausible are high-frequency sediment supply-driven cycles in the stratigraphic record?, Sediment. Geol., 157, 3–13, https://doi.org/10.1016/S0037-0738(03)00066-6, 2003. Coulthard, T. J. and Macklin, M. G.: How sensitive are river systems to climate and land-use changes? A model-based evaluation, J. Quaternary Sci., 16, 347–351, https://doi.org/10.1002/jqs.604, 2001. Coulthard, T. J. and Van De Wiel, M. J.: Quantifying fluvial non linearity and finding self organized criticality? Insights from simulations of river basin evolution, Geomorphology, 91, 216–235, https://doi.org/10.1016/j.geomorph.2007.04.011, 2007. Coulthard, T. J. and Van de Wiel, M. J.: Climate, tectonics or morphology: what signals can we see in drainage basin sediment yields?, Earth Surf. Dynam., 1, 13–27, https://doi.org/10.5194/esurf-1-13-2013, 2013. 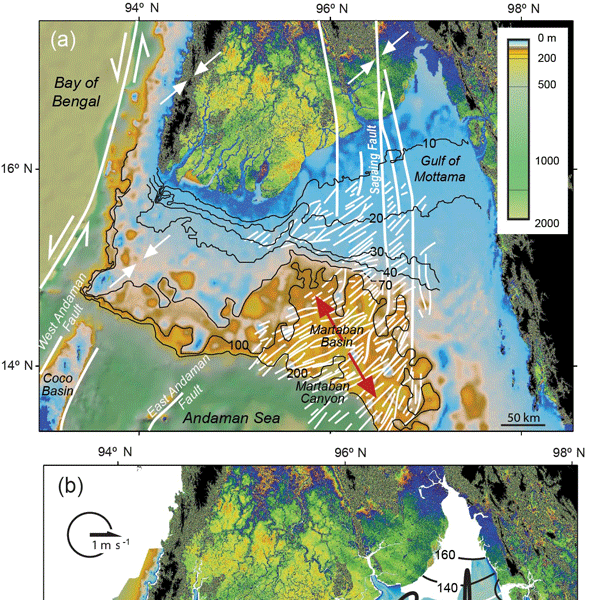 Coulthard, T. J. and Van De Wiel, M. J.: Modelling long term basin scale sediment connectivity, driven by spatial land use changes, Geomorphology, https://doi.org/10.1016/j.geomorph.2016.05.027, in press, 2016. 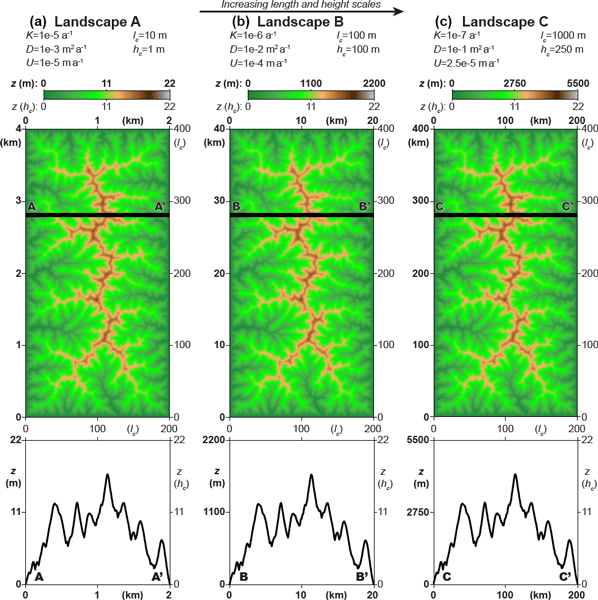 Coulthard, T. J., Kirkby, M. J., and Macklin, M. G.: Non-linearity and spatial resolution in a cellular automaton model of a small upland basin, Hydrol. Earth Syst. Sci., 2, 257–264, https://doi.org/10.5194/hess-2-257-1998, 1998. Coulthard, T. J., Macklin, M. G., and Kirkby, M. J.: A cellular model of Holocene upland river basin and alluvial fan evolution, Earth Surf. Proc. Land., 27, 269–288, https://doi.org/10.1002/esp.318, 2002. Coulthard, T. J., Lewin, J., and Macklin, M. G.: Modelling differential catchment response to environmental change, Geomorphology, 69, 222–241, https://doi.org/10.1016/j.geomorph.2005.01.008, 2005. Coulthard, T. J., Hancock, G. R., and Lowry, J. B. C.: Modelling soil erosion with a downscaled landscape evolution model, Earth Surf. Proc. Land., 37, 1046–1055, https://doi.org/10.1002/esp.3226, 2012a. Coulthard, T. J., Ramirez, J., Fowler, H. J., and Glenis, V.: Using the UKCP09 probabilistic scenarios to model the amplified impact of climate change on drainage basin sediment yield, Hydrol. Earth Syst. Sci., 16, 4401–4416, https://doi.org/10.5194/hess-16-4401-2012, 2012b. 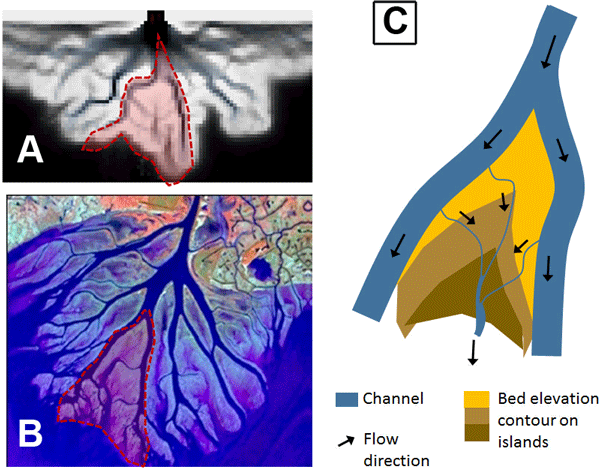 Coulthard, T. J., Neal, J. C., Bates, P. D., Ramirez, J., de Almeida, G. A. M., and Hancock, G. R.: Integrating the LISFLOOD-FP 2D hydrodynamic model with the CAESAR model: Implications for modelling landscape evolution, Earth Surf. Proc. Land., 38, 1897–1906, https://doi.org/10.1002/esp.3478, 2013a. Coulthard, T. J., Ramirez, J. A., Barton, N., Rogerson, M., and Brücher, T.: Were rivers flowing across the Sahara during the last interglacial? Implications for human migration through Africa, PLoS One, 8, e74834, https://doi.org/10.1371/journal.pone.0074834, 2013b. Einstein, H. A.: The bed-load function for sediment transport in open channel flows, in Technical Bulletin No. 1026, USDA Soil Conservation Service, vol. 1026, U.S. Department of Agriculture, available at: http://books.google.com/books?hl=en&lr=&id=xIhtv2wpR9oC&pgis=1 (last access: 23 August 2012), p. 71, 1950. Finnerty, B. D., Smith, M. B., Seo, D.-J., Koren, V., and Moglen, G. E.: Space-time scale sensitivity of the Sacramento model to radar-gage precipitation inputs, J. Hydrol., 203, 21–38, https://doi.org/10.1016/S0022-1694(97)00083-8, 1997. Gabellani, S., Boni, G., Ferraris, L., von Hardenberg, J., and Provenzale, A.: Propagation of uncertainty from rainfall to runoff: A case study with a stochastic rainfall generator, Adv. Water Resour., 30, 2061–2071, https://doi.org/10.1016/j.advwatres.2006.11.015, 2007. Hancock, G. R. R., Coulthard, T. J. J., and Lowry, J. 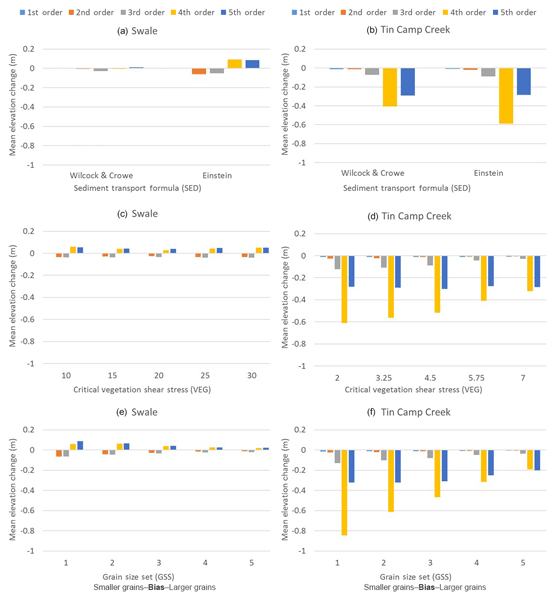 B. C. B. C.: Predicting uncertainty in sediment transport and landscape evolution – the influence of initial surface conditions, Comput. Geosci., 90, 117–130, https://doi.org/10.1016/j.cageo.2015.08.014, 2016. Hearman, A. J. and Hinz, C.: Sensitivity of point scale surface runoff predictions to rainfall resolution, Hydrol. Earth Syst. Sci., 11, 965–982, https://doi.org/10.5194/hess-11-965-2007, 2007. Kouwen, N. and Garland, G.: Resolution considerations in using radar rainfall data for flood forecasting, Can. J. Civil. Eng., 16, 279–289, https://doi.org/10.1139/l89-053, 1989. Krajewski, W. F., Lakshmi, V., Georgakakos, K. P., and Jain, S. C.: A Monte Carlo Study of rainfall sampling effect on a distributed catchment model, Water Resour. Res., 27, 119–128, https://doi.org/10.1029/90wr01977, 1991. Lague, D., Hovius, N. and Davy, P.: Discharge, discharge variability, and the bedrock channel profile, J. Geophys. Res.-Earth, 110, 1–17, https://doi.org/10.1029/2004JF000259, 2005. Lobligeois, F., Andréassian, V., Perrin, C., Tabary, P., and Loumagne, C.: When does higher spatial resolution rainfall information improve streamflow simulation? An evaluation using 3620 flood events, Hydrol. Earth Syst. Sci., 18, 575–594, https://doi.org/10.5194/hess-18-575-2014, 2014. MetOffice: 5 km Resolution UK Composite Rainfall Data from the Met Office NIMROD System, NCAS Br. Atmos. Data Centre, available at: http://catalogue.ceda.ac.uk/uuid/82adec1f896af6169112d09cc1174499 (last access: 20 September 2016), 2003. Molnar, P., Anderson, R. S., Kier, G. and Rose, J.: Relationships among probability distributions of stream discharges in floods, climate, bed load transport, and river incision, J. Geophys. Res.-Earth, 111, 1–10, https://doi.org/10.1029/2005JF000310, 2006. Nicótina, L., Alessi Celegon, E., Rinaldo, A., and Marani, M.: On the impact of rainfall patterns on the hydrologic response, Water Resour. Res., 44, 1–14, https://doi.org/10.1029/2007WR006654, 2008. Ogden, F. L. and Julien, P. Y.: Runoff model sensitivity to radar rainfall resolution, J. Hydrol., 158, 1–18, https://doi.org/10.1016/0022-1694(94)90043-4, 1994. Pessoa, M. L., Bras, R. L., and Williams, E. R.: Use of Weather Radar for Flood Forecasting in the Sieve River Basin: A Sensitivity Analysis, J. Appl. Meteorol., 32, 462–475, https://doi.org/10.1175/1520-0450(1993)032<0462:uowrff> 2.0.co;2, 1993. Segond, M. L., Wheater, H. S., and Onof, C.: The significance of spatial rainfall representation for flood runoff estimation: A numerical evaluation based on the Lee catchment, UK, J. Hydrol., 347, 116–131, https://doi.org/10.1016/j.jhydrol.2007.09.040, 2007. Simpson, G. and Castelltort, S.: Model shows that rivers transmit high-frequency climate cycles to the sedimentary record, Geology, 40, 1131–1134, https://doi.org/10.1130/G33451.1, 2012. Sólyom, P. B. and Tucker, G. E.: The importance of the catchment area-length relationship in governing non-steady state hydrology, optimal junction angles and drainage network pattern, Geomorphology, 88, 84–108, https://doi.org/10.1016/j.geomorph.2006.10.014, 2007. Tucker, G. E. and Bras, R. L.: A stochastic approach to modeling the role of rainfall variability in drainage basin evolution, Water Resour. Res., 36, 1953, https://doi.org/10.1029/2000WR900065, 2000. Tucker, G. E. and Hancock, G. R.: Modelling landscape evolution, Earth Surf. Proc. Land., 35, 28–50, https://doi.org/10.1002/esp.1952, 2010. Tustison, B., Harris, D., and Foufoula-Georgiou, E.: Scale issues in verification of precipitation forecasts, J. Geophys. Res.-Atmos., 106, 11775–11784, https://doi.org/10.1029/2001JD900066, 2001. Wainwright, J. and Parsons, A. J.: The effect of temporal variations in rainfall on scale dependency in runoff coefficients, Water Resour. Res., 38, 7-1–7-10, https://doi.org/10.1029/2000WR000188, 2002. Welsh, K. E., Dearing, J. A., Chiverrell, R. C., and Coulthard, T. J.: Testing a cellular modelling approach to simulating late-Holocene sediment and water transfer from catchment to lake in the French Alps since 1826, Holocene, 19, 785–798, https://doi.org/10.1177/0959683609105303, 2009. 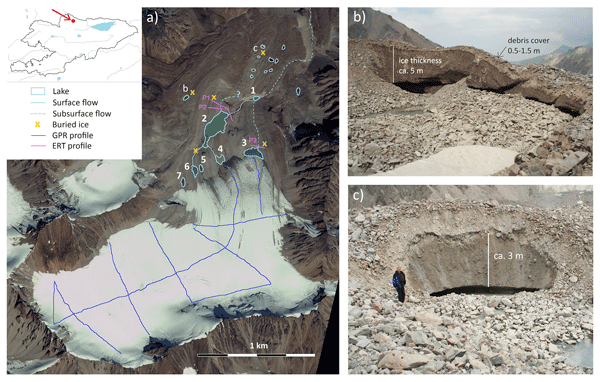 Van De Wiel, M. J. and Coulthard, T. J.: Self-organized criticality in river basins: Challenging sedimentary records of environmental change, Geology, 38, 87–90, https://doi.org/10.1130/G30490.1, 2010. 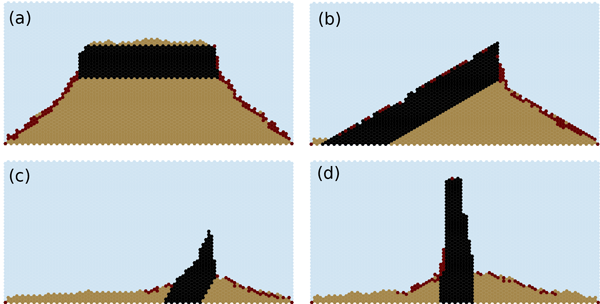 Van De Wiel, M. J., Coulthard, T. J., Macklin, M. G., and Lewin, J.: Embedding reach-scale fluvial dynamics within the CAESAR cellular automaton landscape evolution model, Geomorphology, 90, 283–301, https://doi.org/10.1016/j.geomorph.2006.10.024, 2007. Wilcock, P. R. P. and Crowe, J. J. C.: Surface-based transport model for mixed-size sediment, J. Hydraul. Eng., 129, 120–128, https://doi.org/10.1061/(ASCE)0733-9429(2003)129:2(120), 2003. Willgoose, G.: User Manual for Siberia (version 8:30), July, 115, http://csdms.colorado.edu/w/images/SIBERIA_8.30_Manual.pdf (last access: 22 September 2016), 2005. Willgoose, G. and Riley, S.: The long-term stability of engineered landforms of the Ranger Uranium Mine, Northern Territory, Australia: Application of a catchment evolution model, Earth Surf. Proc. Land., 23, 237–259, https://doi.org/10.1002/(SICI)1096-9837(199803)23:3<237::AID-ESP846>3.0.CO;2-X, 1998. Wilson, C. B., Valdes, J. B., and Rodriguez-Iturbe, I.: On the influence of the spatial distribution of rainfall on storm runoff, Water Resour. Res., 15, 321–328, https://doi.org/10.1029/WR015i002p00321, 1979.